В этот раз проведем обзор и выскажем отзывы о добротном среднепроцентном проекте Trade Professional (официальный сайт). Легенда о трейдерской деятельности на валютном и криптовалютном рынках, а также майнинге криптовалют подкреплена качественной презентацией с еженедельной отчетностью и официальной регистрацией компании. 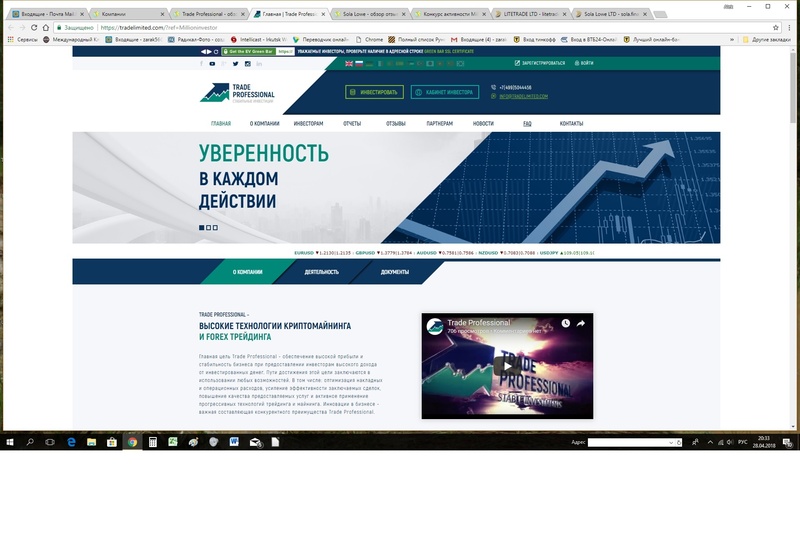 Более детально ознакомиться с Trade Professional, анализом, инструкцией по работе и отзывом о проекте вы можете, нажав «Читать далее». Не понятно, платит или нет?! https://uploads.disquscdn.com/images/9239c388ebe9e1f5c5987b40b64f43637d665ed9d4caa5239b2db4ea5703fa27.png На мониторах платит. 13:58 05.04.18	Receive	210739589	U14254498 Trade Professional Ltd	+18.00 Received Payment 18.00 USD from account U14254498. Memo: API Payment. Invoice 34194, Millioninvestor. 08.21.18 15:21	Receive	225414498	U14254498 Trade Professional Ltd	+3.2 Received Payment 3.2 USD from account U14254498. Memo: API Payment. Invoice 53326, Millioninvestor. 08.20.18 13:12	Receive	225292917	U14254498 Trade Professional Ltd	+3.2 Received Payment 3.2 USD from account U14254498. Memo: API Payment. Invoice 53143, Millioninvestor. 08.20.18 11:11	Receive	225277783	U14254498 Trade Professional Ltd	+6.4 Received Payment 6.4 USD from account U14254498. Memo: API Payment. Invoice 53009, Millioninvestor. 08.17.18 17:48	Receive	225026626	U14254498 Trade Professional Ltd	+6.4 Received Payment 6.4 USD from account U14254498. Memo: API Payment. Invoice 52627, Millioninvestor. 08.15.18 09:51	Receive	224746638	U14254498 Trade Professional Ltd	+9.6 Received Payment 9.6 USD from account U14254498. Memo: API Payment. Invoice 52241, Millioninvestor. 08.13.18 10:17	Receive	224516804	U14254498 Trade Professional Ltd	+12.8 Received Payment 12.8 USD from account U14254498. Memo: API Payment. Invoice 51845, Millioninvestor. Trade Professional Ltd Received Payment 3.2 USD from account U14254498. Memo: API Payment. Invoice 59246, Millioninvestor. Trade Professional Ltd Received Payment 3.2 USD from account U14254498. Memo: API Payment. Invoice 59060, Millioninvestor. Trade Professional Ltd Received Payment 3.2 USD from account U14254498. Memo: API Payment. Invoice 58906, Millioninvestor. Trade Professional Ltd Received Payment 3.2 USD from account U14254498. Memo: API Payment. Invoice 58863, Millioninvestor. 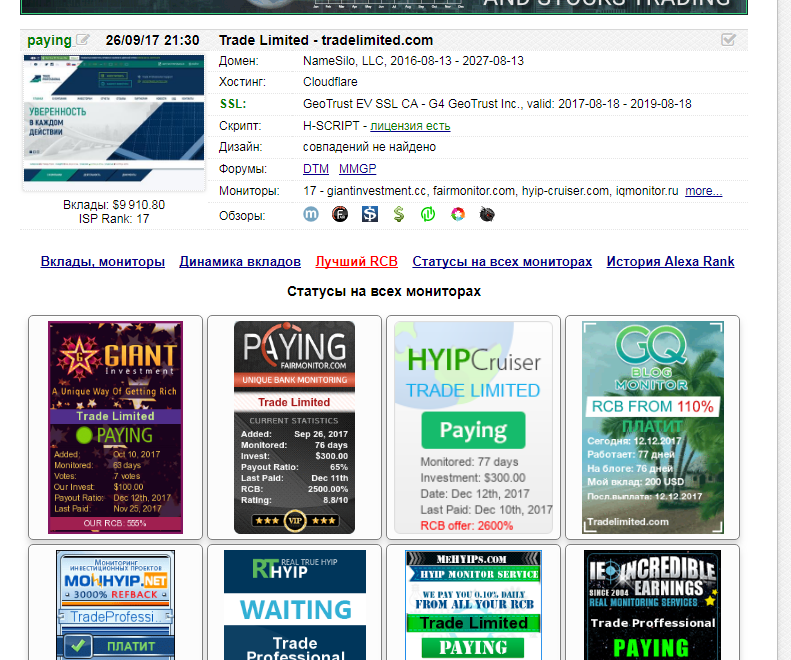 Trade Professional Ltd Received Payment 1.00 USD from account U14254498. Memo: API Payment. Invoice 59726, Millioninvestor. Trade Professional Ltd Received Payment 6.4 USD from account U14254498. Memo: API Payment. Invoice 59593, Millioninvestor. Trade Professional Ltd Received Payment 6.4 USD from account U14254498. Memo: API Payment. Invoice 60147, Millioninvestor. Trade Professional Ltd Received Payment 6.4 USD from account U14254498. Memo: API Payment. Invoice 60480, Millioninvestor. Trade Professional Ltd Received Payment 3.2 USD from account U14254498. Memo: API Payment. Invoice 61079, Millioninvestor. Trade Professional Ltd Received Payment 9.6 USD from account U14254498. Memo: API Payment. Invoice 60954, Millioninvestor. Trade Professional Ltd Received Payment 6.4 USD from account U14254498. Memo: API Payment. Invoice 61564, Millioninvestor. Trade Professional Ltd Received Payment 6.4 USD from account U14254498. Memo: API Payment. Invoice 61864, Millioninvestor. Trade Professional Ltd Received Payment 3.2 USD from account U14254498. Memo: API Payment. Invoice 62014, Millioninvestor. Trade Professional Ltd Received Payment 6.4 USD from account U14254498. Memo: API Payment. Invoice 62384, Millioninvestor. Trade Professional Ltd Received Payment 6.4 USD from account U14254498. Memo: API Payment. Invoice 62677, Millioninvestor. Trade Professional Ltd Received Payment 9.6 USD from account U14254498. Memo: API Payment. Invoice 63283, Millioninvestor. Trade Professional Ltd Received Payment 3.2 USD from account U14254498. Memo: API Payment. Invoice 62850, Millioninvestor. Trade Professional Ltd Received Payment 3.2 USD from account U14254498. Memo: API Payment. Invoice 63676, Millioninvestor. Trade Professional Ltd Received Payment 3.2 USD from account U14254498. Memo: API Payment. Invoice 63879, Millioninvestor. Trade Professional Ltd Received Payment 3.2 USD from account U14254498. Memo: API Payment. Invoice 63546, Millioninvestor. Trade Professional Ltd Received Payment 3.2 USD from account U14254498. Memo: API Payment. Invoice 64168, Millioninvestor. Trade Professional Ltd Received Payment 3.2 USD from account U14254498. Memo: API Payment. Invoice 64291, Millioninvestor. Trade Professional Ltd Received Payment 3.2 USD from account U14254498. Memo: API Payment. Invoice 64458, Millioninvestor. Trade Professional Ltd Received Payment 3.2 USD from account U14254498. Memo: API Payment. Invoice 64697, Millioninvestor. Trade Professional Ltd Received Payment 3.2 USD from account U14254498. Memo: API Payment. Invoice 65299, Millioninvestor. Trade Professional Ltd Received Payment 9.6 USD from account U14254498. Memo: API Payment. Invoice 65146, Millioninvestor. Trade Professional Ltd Received Payment 3.2 USD from account U14254498. Memo: API Payment. Invoice 65448, Millioninvestor.